Rowdy is a 4 year-old MN Chihuahua mix with a history of recently spending time in the back yard digging through the dirt and snooping in areas he probably shouldn’t. 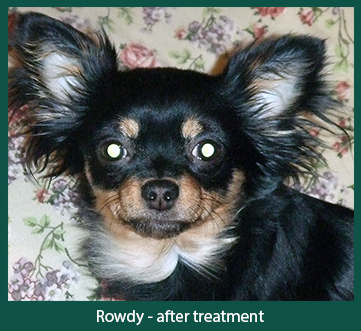 He presented to ADRC about 3 days after developing red bumps concentrated on the top of his muzzle. The affected area was extremely itchy and rubbed his nose on objects and pawed at his nose. Before today’s presentation, there was no history of skin disease. The changes on the muzzle were consistent with ulcerative inflammatory papules that were red in color and bleeding from self-trauma (rubbing and scratching). No other abnormalities were noted. A surface cytology was collected and numerous eosinophils (defined as a white blood cell often associated with an allergic reaction) with several neutrophils and bacteria were found. A diagnosis of eosinophilic furunculosis (hair follicule rupture) of the face was made based on history and cytology. Prognosis is good with antibiotics and systemic glucocorticoids (steroids). One month after therapy Rowdy was back to his normal self. 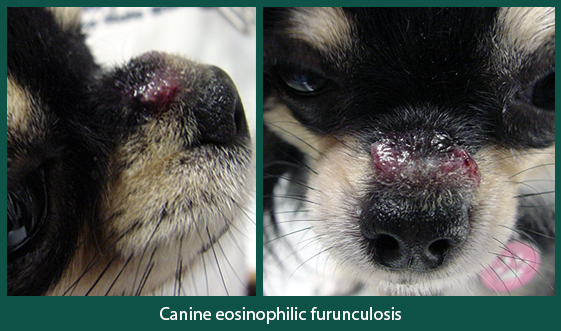 Canine eosinophilic furunculosis of the face is an immediate severe condition of the face. The exact cause is unknown, a hypersensitivity reaction to insect stings or spider bites is highly suspected. It is uncommon in dogs, and occurs often in adult inquisitive dogs with access to a yard.